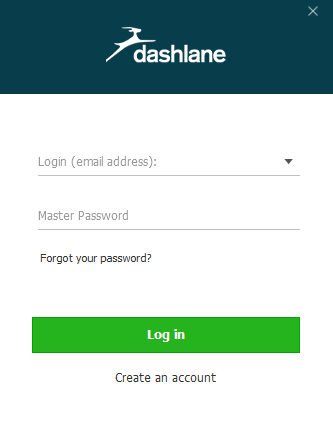 With Dashlane, you no longer have to manage multiple usernames and passwords. You'll save time as we effortlessly sign you up and sign you in to your favorite websites. This is a quick guide to get you quickly up and running with Dashlane. When you open Dashlane on your computer, you will see this window. Click on Log in if you already have an account or click on Create an account. If you are logging in to your already existing account, please check this page. If you are creating your account, please keep on reading this article. The first time you launch Dashlane, you will need to set up your account. It's quick and easy to setup. The first thing you will need to do is assign an email address and a Master Password to your Dashlane account. Remember this is your Master Password, the key to all of your passwords, so pick something strong but also one you can remember. To keep security as strong as possible we do not store your Master Password anywhere by default. This means if you forget it, we cannot send it to you and it cannot be recovered. The only way to use your Dashlane account if you forget it is to reset your account completely, and lose all your data. Note that you can choose to let the application remember your Master Password, but it will still be required from time to time. Now you can go through all the introduction screens. Click the Next button at the bottom right to get started. Your passwords will be automatically imported from your browsers, but you can manually import them if you need to. Note that data cannot be imported from iOS or Android for now. Please use Dashlane on Windows or Mac OS X to import data from your browsers, from another application or from a CSV file. Then select the browsers you want to import your credentials from. You can also import from other password managers from this menu. Now that you have your data in your Dashlane account, let's see how to set up Dashlane for browsing! On Windows and Mac OS X, Dashlane will install a browser extension in your Chrome, Firefox, Internet Explorer or Safari browsers. You can choose in which browsers specifically when installing Dashlane or when launching it for the first time. If you cannot see Dashlane in your browser, you may need to install or reinstall the browser extension using the Extensions menu (Windows) or Dashlane > Install browser extensions… menu (Mac OS X) in the Dashlane application. If you've just signed up for Dashlane you'll be prompted to enter your information to permit the Dashlane extension to automatically fill in forms while you browse the web. This way, once you've entered your information, you'll be able to see the feature at work. On iOS, you can browse sites either using the embedded browser inside the Dashlane app, or using using the Dashlane extension for Safari. On Android, you need to use the Dashlane browser, which is installed at the same time as the Dashlane app on your device. There are no Dashlane extensions for browsers on Android, as the Android system does not allow a fully secure way to communicate with other apps. We hope that this will be addressed in a future update of the Android system. Now that you've got the basics set up, click here to find out how to use Dashlane!